More job opportunities and better pay are attracting more islanders to Miami. Some who came after Hurricane Maria are opting to stay. MIAMI — The morning after Hurricane Maria churned through Puerto Rico in September of 2017, Ever Sánchez and Adele Corujo looked out on their once leafy street in their middle-class neighborhood in San Juan and saw a wrecked landscape. Their own house was not badly damaged but they had no electricity, no running water, and no food. For them, Maria was the final blow. It came on top of a deepening economic crisis with shrinking salaries and fewer services. They had considered getting out but held back, reluctant to give up on their birthplace. That changed overnight after Maria. Though flights out of the island were full or canceled, Sánchez's sister in Miami had connections to a cruise line and said she would try to get tickets for them aboard a passenger ship on a humanitarian mission to San Juan. When they got the call late one afternoon, they packed their car and rushed to the port. Sánchez and Corujo went to Florida, the latest in a recent migration wave to the Sunshine State that began around 2006 with the island's economic crisis. The Puerto Rican population in Florida shot up from 479,000 in 2000 to over 1 million in 2015, according to the Pew Research Center. There was an uptick after the hurricane — during the 8 months after the storm, about 30,000 to 50,000 Puerto Ricans permanently settled in Florida, according to Stefan Rayer, Population Program Director at the University of Florida’s Bureau of Economic and Business Research. 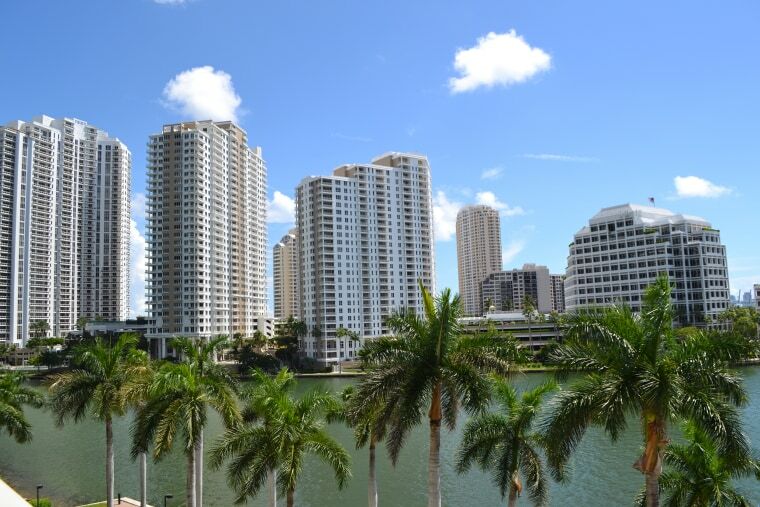 While most headlines about Florida's growing Puerto Rican presence focus on the Orlando-Kissimmee metro area, a growing number of professionals have been coming to Miami, attracted by the higher salaries and standard of living. This flow of upper-and-middle-class doctors, lawyers, dentists, teachers and entrepreneurs to South Florida is not new. For the past few decades, the Miami metropolitan area has become the home to thousands coming from South and Central America and the Caribbean, arriving with university degrees, work experience and lots of buying power. Puerto Rican influence in Miami affairs dates back to the city's first Hispanic mayor, Mauricio Ferré, now 83. The nephew of the former governor of Puerto Rico, Luis A. Ferré, he was the son of a businessman, Jose Ferré, who embarked into real estate development and construction in Miami in the 1920s. Born in Puerto Rico, Mauricio enrolled in the University of Miami in 1953 and was elected mayor in 1973, the first mayor of Puerto Rican origin in the U.S. But after the end of Ferré’s six terms, in 1985, Puerto Ricans saw their influence diminished. Puerto Ricans in Miami have been “invisible,” Professor Duany said in a recent interview at his office. Unlike other Latino subgroups, Puerto Ricans are dispersed in the sprawling tri-county metropolis that includes Miami-Dade, Broward and Palm Beach counties, explained Duany. There’s no Puerto Rican nucleus, no Little Puerto Rico. “The best example of how Puerto Ricans are becoming more visible in Miami is the recent FIU symposium on Puerto Rico, organized by the Puerto Rican Alliance of South Florida. I do think that the post-Maria influx has heightened the need for Puerto Ricans to organize and become more vocal in local affairs," he said. Longtime Puerto Ricans in Miami agree. “I have Puerto Rican friends working in the best hospitals, in dental offices, in law firms,” said Emil R. Infante, 48, a partner in the law firm Holland & Knight, who has lived in Miami 19 years. “They’ve got U.S. passports, they’re bilingual, and they have professional experience, and they make more money in lower level jobs here than high-level jobs there." His colleague at Holland & Knight, Manuel A. Miranda, 30, is now making at least three times more than what he made in the island a few years ago. “I was in Florida when the hurricane hit,” said Miranda, though he traveled to San Juan to visit family and friends and see the devastation. After the hurricane, his mother and grandmother decided to move to Miami permanently. He is doing the same. Unlike Miranda, Andrea Cristina Ruiz-Sorrentini, 25, is not sure if she’ll stay in Miami. For now, though, the Florida city is her home. At a coffee shop in south Miami, she recalled a carefree childhood growing up near the Caribbean Sea in Cabo Rojo, located in southwest Puerto Rico. “I was always a beach girl,” she said. Ruiz-Sorrentini's father was a landscaper, her mother a pharmacist. “Early on, I knew I wanted to work for the people and with the people, and that I wanted to be in the mental health field,” she said. After finishing her biology and psychology degree at the University of Puerto Rico, she left in 2016 to get a master’s in community psychology at the University of Miami and was there when Maria struck. Her parents’ home was spared, but nearby houses and farms were battered. “My mother immediately joined relief efforts. I felt inspired by the importance of the empowerment of our communities," she said. For her thesis, Ruiz-Sorrentini interviewed Puerto Ricans who came to the Miami area after the hurricane. “I’ve met different entrepreneurs, restaurant owners and event organizers that moved from Puerto Rico and other states because Miami is mostly a Latin community and it’s very close to Puerto Rico. From the people that I interviewed and the ones that I met during and after the hurricane relief efforts, I can say that the majority of them are professionals, middle-class Puerto Ricans who have their own business or moved to find better job opportunities in Miami,” she said. It’s now been a year since Ever Sánchez, 51, and Adele Corujo, 56, embarked on their week long sea journey from San Juan to Miami with their older daughter, Haina, 25, who didn’t want to leave and screamed, “You’re kidnapping me,” as they made the emotionally tough journey. Their younger daughter, Michelle, 21, was away in college in New Orleans. Corujo’s longing is a thread in some of these stories. But most Puerto Ricans in Miami don’t see themselves going back to live in the island they left behind. “I’ll visit but I’ll never return to live there,” said Melissa K. Rivera, 36, the manager of Red, a steakhouse in Miami Beach. Born in New York, where her father was a state trooper and her mother a bartender, she grew up in Puerto Rico and got a degree in hospitality management at the Universidad del Este. She worked at the Ritz-Carlton in San Juan, and later managed a club, Blue Martinera. “Despite the terrible economy, I was okay. I was determined to stay, to see it through,” said Rivera. Then the hurricane hit, and weeks went by without water or electricity, so the club closed down. “I decided to leave,” she said. Rivera called on her contacts in the food and beverage industry and lucked out. She went through the interviews via Skype (cell phones weren’t working in San Juan) and was hired by The Betsy, a Miami Beach hotel. A week before leaving the island, she married Mari Cruz, 32, a nurse, and together they flew out on November 17, on the earliest flight they could book. They have since settled in Miami Beach and expect to stay permanently.